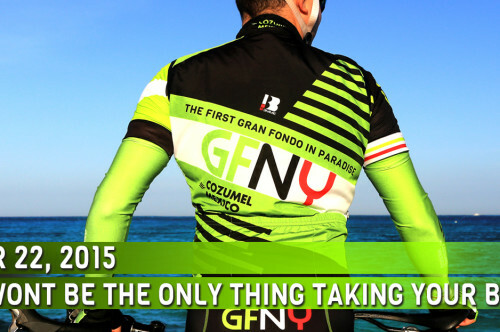 Join GFNY on Nov 22, 2015 for a ride that you will never forget through the breath taking island of Cozumel. The Gran Fondo will take you all the way around the island, as you enjoy the spectacular views of this Mayan paradise. You will ride through 20 miles of coastline roads, which stretch along the tempting turquoise ocean, as you push yourself through the island’s challenging winds. GET READY– this will be a truly challenging and competitive race with some amazing athletes ready to conquer the island as the Mayans did 3000 years ago. Come see why Cozumel has become a top destination for many of the world’s most ambitious athletes. GFNY COZUMEL has partnered with Uli and Lidia of Gran Fondo New York to make sure your event is a true Gran Fondo style experience! The GFNY Cozumel course is filled with fascinating views and challenging roads. There are two distances to choose from, either the Gran Fondo 100 miles or the Medio Fondo 50 miles. Your race will start in the downtown area right by the city hall and the Mexican caribbean ocean. Get ready for a fun filled start with live bands, helicopters in the sky, media and journalists plus over 2,000 participants all ready to give 100% effort on the race course. No matter which course you choose we promise you will be mesmerized by the beautiful beach and ocean views and the support of all the locals who will be out in big numbers to cheer you to the finish line. The Gran route 100 miles) is a ride that will take your breath away in more ways than you can imagine. Your journey will take you thru two challenging hot laps around the coastline of this beautiful island, with more than 40 miles of picturesque turquoise ocean views. Along the way, you’ll be challenged by strong Mayan winds and celebrated by the town locals as if you were a Tour de France champion. The Medio route offers the same breathtaking views as the Gran, but instead of two laps the route is shortened to one lap around the island. Don’t be fooled this is still a challenging ride for many, especially with the strong winds and competitive group of riders.